Just this last week we’ve started harvesting some veggies from our garden. 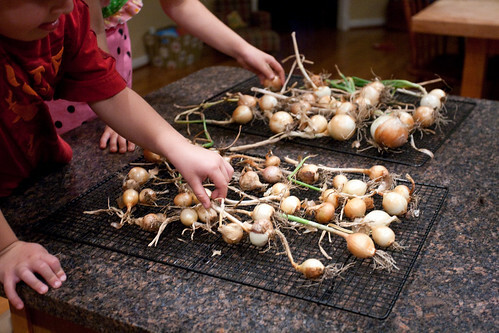 It started with the onions, sort of on a whim, last Friday and we pulled them all. Weeds were seriously encroaching into the bed and the tops had pretty much died back. I bought two packs of onion sets back around St Patrick’s Day on a whim for something like $2. One was for regular sized onions and one for little ones. Ours definitely were on the small sized but hey, onions from our own garden! And tonight we dug out our potatoes. The tops had totally died back. 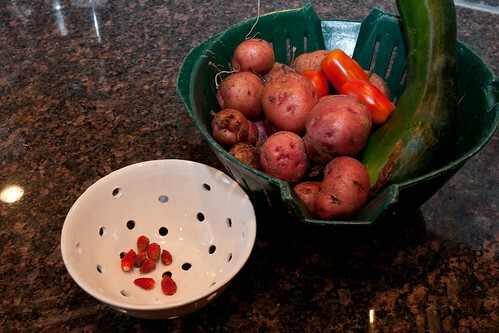 I was very skeptical about what we would find since I forgot to order potato sets and had just cut up some organic potatoes I had in the pantry at planting time. We also discovered a fairly sizable zucchini and three ripe tomatoes. Many more tomatoes will be following shortly as well as a whole bunch of yellow squash. What’s growing in your gardens? I am in-between harvests right now. The broccoli and peas are done. I have two little eggplants that are growing daily, and the tomato plants are full of green fruits. The waiting is so hard, but the payoff is going to be awesome! our tomatoes are getting demolished by something…we’re working on figuring out what it is. so hopefully all my tomato canning questions won’t be for nothing. ugh.